This Arduino digital capacitive touch sensor provides a one-touch style switch on your Arduino project. It uses the most popular capacitive sensing technology which is the same as your mobile phone. This little sensor can "feel" people and metal touch and feedback a high/low voltage level. Even isolated by cloth or paper, it still can feel the touch. The sensitivity will decrease as the isolation getting thick. For detail of usage, please check its wiki. To ease the difficult of using this sensor, a Gravity Interface is adapted to allow plug&play. 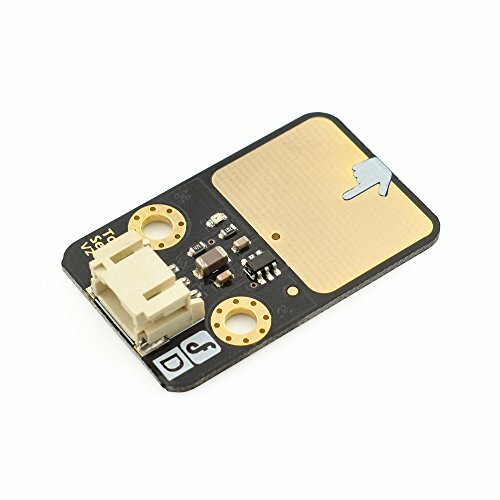 The IO expansion shield is the best match for this sound senor connecting to your Arduino. As this sensor can work at 3.3V which make it compatible with Raspberry Pi, Intel Edison, joule and curie. If you want to start playing with sensors, Gravity: 27 Pcs Sensor Kit for Arduino is a great choice for you to learn varieties of sensors. If you have any questions about this product by DFROBOT, contact us by completing and submitting the form below. If you are looking for a specif part number, please include it with your message.